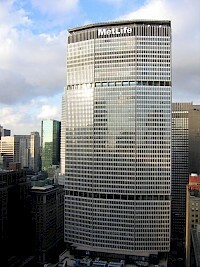 The Citigroup Center (formerly Citicorp Center) is one of the ten tallest skyscrapers in New York City, United States, located at 53rd Street between Lexington Avenue and Third Avenue in midtown Manhattan. 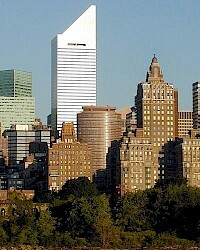 The 59-floor, 915-foot (279-m) building is one of the most distinctive and imposing in New York's skyline, with a 45° angled top and a unique stilt-style base. Detroit Edison Plaza is a large skyscraper in Detroit, Michigan. It is often referred to as "DTE Energy Building", from a large neon sign on the building's top floor. That is incorrect, however, as there is a nearby building with that name. It was constructed in 1971, and contains 25 floors, reaching a height of 374 feet (114 m). It is built in the International style of architecture. 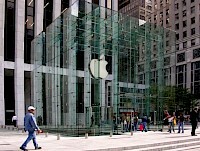 It is composed of steel, with many glass windows. The DTE Energy Building is located at 2000 2nd Avenue in downtown Detroit, Michigan, between Beech Street and West Elizabeth Street. It was constructed in 1921, and stands at nine stories in height. The building is used primarily for offices, and was designed in the renaissance revival arechitectural style. It is a part of the DTE Energy Headquarters complex of buildings. it also stands next to the Detroit Edison Company Service Building. DTE Energy Headquarters is located just west of downtown Detroit, Michigan. It composes of three buildings: Detroit Edison Plaza, DTE Energy Building, and the Detroit Edison Company Service Building. Detroit Edison Plaza (Walker Lee Cisler Building aka WCB) is a large skyscraper. 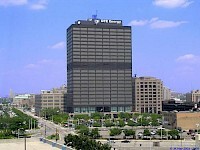 It is often referred to as "DTE Energy Building", from a large neon sign on the building's top floor. That is incorrect, however, as a nearby building is the actual DTE Energy Building. The General Motors Building is a 50-story, 705-foot (215 m) office tower in Manhattan, New York City, facing Fifth Avenue at 59th Street . The building is one of the few structures in Manhattan that occupies a full city block. The building size is approximately 1,774,000 rentable square feet on a plot measuring 200 x 420 (84,350 square feet) that was formerly the site of the Savoy Hotel. 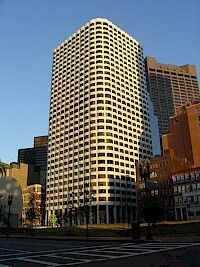 The Keystone Building is a high-rise building located in downtown Boston, Massachusetts. The building stands at 400 feet (122 m) with 32 floors, and was completed in 1971. It is tied with Harbor Towers I as the 26th-tallest building in Boston. The architectural firm who designed the building was Emery Roth & Sons. The Keystone Building is notable for its distinctive rounded corners and grooved facade. The MetLife Building, originally called the Pan Am Building, is a skyscraper located at 200 Park Avenue in Midtown Manhattan, New York City. The MetLife Building (then Pan Am Building) was the largest commercial office building in the world when it opened on March 7, 1963. It is a recognizable part of the Manhattan skyline and one of the fifty tallest buildings in the United States. Pan American World Airways was the building's owner for many years.